I've been wanting to blog about this place for some time now. I absolutely love Jimbo's! Having tried others (Marukame Udon and GoShiGo (which is now closed)), to me, no other udon place compares. You can either ask for skinny or regular noodles, which are btw, homemade. What I think sets them apart is that the dashi (broth) is so tasty. 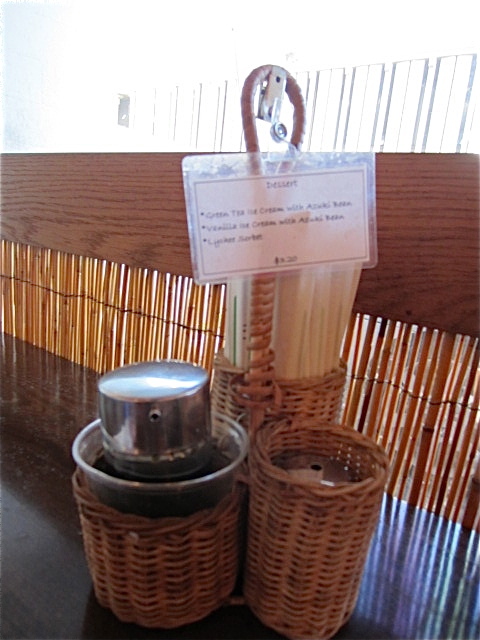 It's got that smoky taste, unlike other places usual salty flavoring, and their broth is oh-so-light. I always end up slurping up the last drops of dashi! 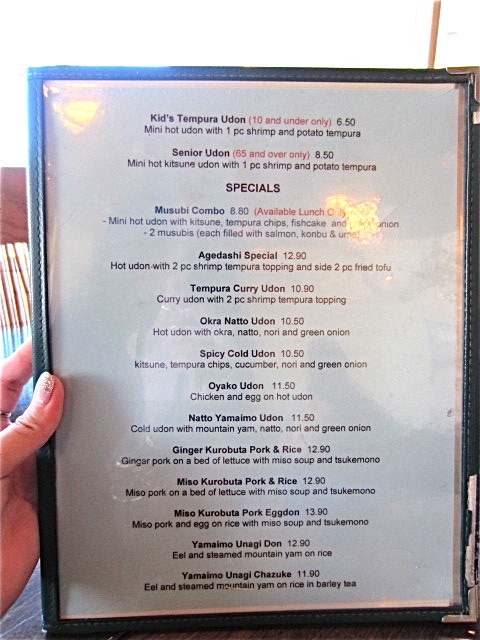 Also, after returning today to satisfy my craving, I noticed they added quite a few more items to their menu. Now you can get Unagi/Yamaimo Don, Bacon Fried Rice, Miso Kurobuta Pork Egg Don or Agedashi Special. Back to the more usual suspects on the menu, there's Oyako Don, Katsu Curry, Curry Udon, Cold Udon, Kakiage Udon, Ten Don (my personal favorite), Tempura Don, Mochi Udon, and Natto/Yamaimo Udon. Located on King Street next to Kochi, there is street parking in the front and back of restaurant. Back parking structure is located on Young Street. Lots of parking there if front lot is full. Today, I had my usual Ten Don Combo (Shrimp Tempura over rice with a small bowl of Udon). So so delicious!! Come with a big appetite- it's a lot of carbs, and for only $14! I've also tried their Inari/Musubi Combo with Udon (served only at lunch, I believe), and also their snow crab and egg udon, which is also delicious, especially if you like crab! They definitely don't skimp on the crab meat, either! My friend, Paddy, had the Yamaimo/Natto Udon with a side of Umeboshi. Let me just say that it was one gooey dinner for him! He fully enjoyed his meal and left nothing in the bowl once we were done, but for me, definitely not my cup of tea. I think all it was missing was a raw egg, which would definitely complete the gooeyness of that Udon bowl. Hours of Operation: Mon-Thurs and Sun 11am-250pm, 5pm-950pm, Friday-Sat 11am-250pm, 5pm-1030pm. Since we're on the subject, I thought I'd mention that I love that this place closes at 250pm for lunch. Sometimes a 2pm close just doesn't cut it! 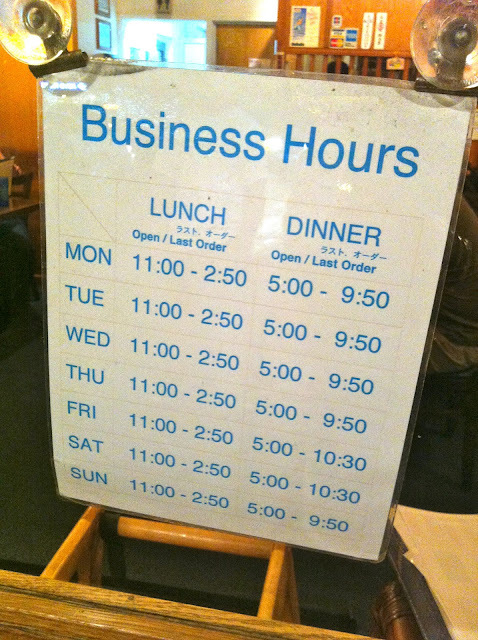 Thank you Jimbo's for staying open almost an hour longer for late-lunchers! If you are craving some good Japanese Udon, this is the place you need to try now. Small place, so if it's crowded, you will have to wait outside for a bit. And at peak times, this place can definitely get crowded. Great for families or a quick working meeting/lunch. Very casual. You can't go wrong with Jimbo's!! Paddy's too fast for my picture-taking skills! This is his Yamaimo/Natto Udon with Umeboshi. The gooeyness in all its glory. My Tempura Ten Don Combo. The perfect little combo meal. UPDATE 7/14: Took my mom to lunch the day after, and decided to try something different! Mom also ventured out and tried a new dish as well. Here we present you with Miso Kurobuta Egg Don and Mom's dish, Shrimp Yaki Udon. My lunch was delicious, and very much different than what I'd expect from Jimbo's. Pork had a sweet/salty taste to it and some pieces were crispy like bacon! YUM! I like that they are expanding their menu! They said they've had the new items for about a couple months now. Try it for yourself! Mom fully enjoyed her meal as well and ate all of it. She said the sauce was light and tasty, and it came with lots of veggies. She just missed the whole shrimp, instead of little baby shrimps. She was expecting the Shrimp tempura shrimp in her Yaki Udon. Besides that, she said she would order it again! Came with seaweed soup also! My Miso Kurobuta Egg Don with side Udon! Take a look at their new menu items! UPDATE! More food items to drool over! Sansai and Nameko Udon with clear broth, NOT the dark broth. My udon with side grilled mochi. I think next time I'll get FRIED mochi. I didn't care much for the burnt edges. with konbu. This combo is my favorite so far!